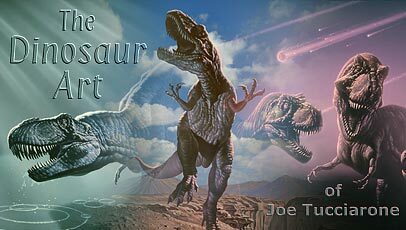 These galleries contain dinosaur illustrations and images of other prehistoric beasts. Each image is accompanied by a description including the animal's size, weight, diet and year of discovery. The dinosaurs are grouped according to shared characteristics. For example, the "Theropods" gallery includes Tyrannosaurus rex and Allosaurus, while Brachiosaurus and Apatosaurus are in the "Sauropods" gallery. The pterosaurs and ancient mammals like the Woolly Mammoth have their own galleries as well. The few non-reptilian animals I have illustrated belong to the Permian, Eocene and Pleistocene which is why no other epochs or periods are listed. The illustrated creatures also appear in an alphabetical "A-Z Animal Index" which can be used to find images of specific animals. All images are protected by copyright. Permission to reproduce any image must be obtained by writing to: joe@joetucciarone.com. Please see our Image Use page for more information.